Editors Note: Previously published in August 2015 on YoOceans.org. Some pictures and graphs have been updated with current information. With economic issues expected to dominate the Oct. 19 Canadian election, the biggest losers could be those within the path of a proposed pipeline expansion that would nearly triple the amount of tar sands oil being sent to the Pacific coast. 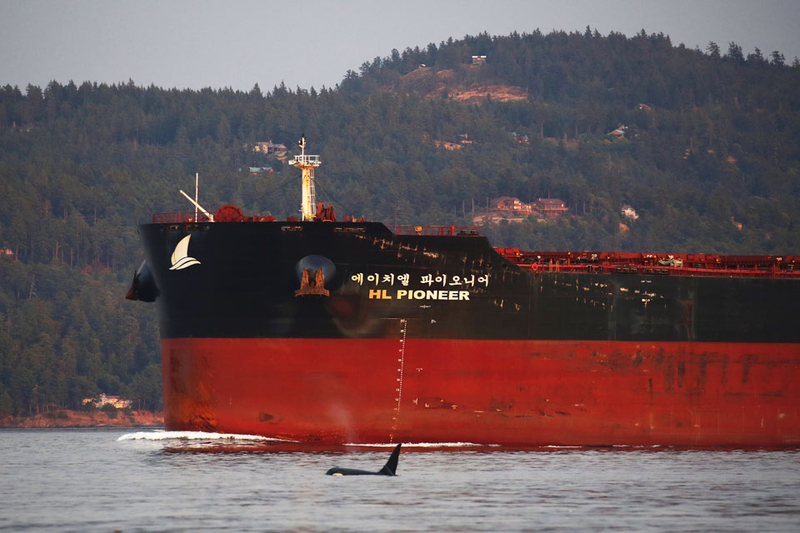 The pipeline threatens orcas, salmon and other forms of wildlife with a tremendous increase in tanker traffic and a greater risk of oil spills—something that could endanger the health and livelihoods of the region’s human inhabitants as well. Kinder Morgan, operator of the Trans Mountain pipeline, wants to build a second one stretching from near Edmonton in Alberta to a marine terminal in the Vancouver area in British Columbia. The project would increase the amount of tar sands oil being shipped through the region from 300,000 barrels of oil each day to up to 890,000 barrels per day. The number of oil tankers in the Port of Vancouver would rise from five to 34 per month. Heavy oil sands, known as bitumen, have to be treated with chemicals to reduce their thickness before transmission through a pipeline. While the toxic effect that lighter crude oil has on the environment is well established, it’s far less clear what impact the heavier, deluded bitumen and its added chemicals would have. This heavier substance is more likely to sink to where it’s out of reach of surface skimmers and retention booms that are typically used for lighter crude oil spills. Prime Minister Stephen Harper, leader of the Conservative party, supports the project and has stacked the deck in the company’s favor. In the past the Canadian Environmental Assessment Agency would’ve judged the environmental issues surrounding such a project, while the National Energy Board focused on its economic impact. Harper used a 2012 omnibus budget bill to strip the CEAA of this authority and turn environmental reviews over to the NEB—to which he’s appointed oil industry supporters and executives. The NEB will offer a recommendation on the project to the federal government, which has the final authority on whether to grant approval, so the election could have an impact on whether it proceeds. The NEB’s decision isn’t expected until January, 2016. On July 28, Harper appointed Steven Kelly to the NEB. Kelly is vice president of oil industry consulting firm HIS Global Canada—the same company that Kinder Morgan hired to do an economic study that justified the pipeline expansion. The Globe and Mail reported 35 intervenors dropped out of the review process on Aug. 12, calling it “biased” and ”unfair.” The intervenors are experts in energy and environmental issues chosen by the NEB to participate in reviewing the project. On Aug. 21 the NEB’s three-member project review panel announced it would delay hearings on the pipeline, noting that Kelly’s appointment to the board could raise concerns about the integrity of the hearing process. “With this in mind, the panel has decided on its own volition to strike from the hearing record all evidence prepared by or the under the direction of Mr. Kelly,” the panel wrote. The panel said it would strike from the record “all evidence prepared by or under the direction of Mr. Kelly.” The Globe and Mail also reported the panel asked Kinder Morgan to identify any evidence prepared by Kelly and to indicate if that material will be replaced. Robyn Allan, an economist and former intervenor in the Trans Mountain project, resigned from this role in May and declared the review process “rigged” in favor of a pipeline expansion. The Vancouver Observer reported that Allan criticized the NEB panel for eliminating the oral cross-examination phase of the project’s review process. Eliesen also criticized the board for eliminating the oral cross-examination phase and called it a “critical part” of all previous hearings for such projects. He complained that the board went along with the company’s refusal to answer numerous questions asked by interveners and British Columbia’s provincial government. An Ipsos poll released July 30 indicated environmental protection ranked fifth on a list of concerns among Canadians, with 29 percent of them listing it as one of their top five issues—below such economic issues as the cost of living and food prices. According to the Vancouver Observer, Liberal leader Justin Trudeau said he supports the pipeline, provided it obtains community permission. His office later told the paper that Trudeau does not “unconditionally” support the pipeline expansion but is “interested” in seeing it approved if environmental standards and “buy-in” from First Nations are met. The company struck deals with many of Canada’s First Nations yet two of them, the Tsleil-Waututh Nation and Tsartlip Nation, are staunchly opposed to the expansion. Both of them reside along waterways that would be impacted by the increased tanker traffic and a potential oil spill. It’s not clear where New Democratic Party leader Tom Mulcair stands on the issue. During an Aug. 6 televised debate, the Globe and Mail reported, Mulcair said he supports a stronger environmental review process, but hasn’t said whether he supports or opposes the Trans Mountain project. Only Elizabeth May, leader of the Green party, has said she unequivocally opposes the pipeline. The National Observer reported that Burnaby Mayor Derek Corrigan vowed to lie down in front of bulldozers in order to stop the pipeline. “That’s a hard thing to promise for a lawyer and a mayor. It will probably be the end of my career, but if I end my career on that note, it will be something that I’m very proud of, that I stood my ground,” Corrigan declared. Vancouver Mayor Gregor Robertson is cited a specially-commissioned environmental study in his opposition to the project. 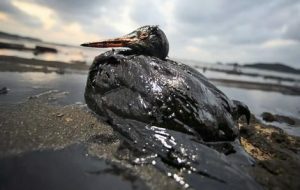 The study, commissioned by the City of Vancouver, the Tsleil-Waututh Nation and the Living Oceans Society, a Canadian environmental group, indicated a large spill of diluted bitumen near Vancouver could kill more than 100,000 birds and seriously harm other mammals, the National Observer Reported. “Extraordinarily high densities and numbers of sea and shorebirds, marine mammals and fish make them especially vulnerable to the potentially devastating mortalities should a major oil spill occur in Burrard Inlet or the Fraser River estuary,” according to the study. The study was authored by Dr. Jeffrey Short, an expert on the effects of oil spills. 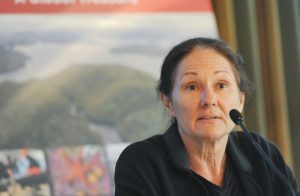 Short was chief chemist for the state of Alaska and the U.S. government, assessing the damage and restoration efforts after the Exxon Valdez oil spill. The study called the Salish Sea, a network of coastal waterways around Canadian British Columbia and Washington State in the U.S., a vital coastal habitat. The report also said the Fraser River is the largest salmon producing river on the entire North American Pacific Coast—including Alaska. The National Observer noted the Trans Mountain Pipeline makes more than 80 water crossings within the Lower Fraser River watershed, putting millions of salmon at risk from a spill. 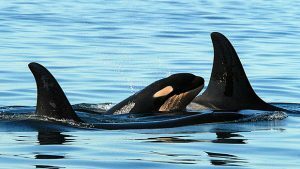 Southern Resident killer whales, also known as orcas, are already listed as endangered under Canada’s Species at Risk Act. According to the Raincoast Conservation Foundation, the population has experienced almost no growth over the past four decades and has declined over the past two decades. Raincoast also noted the proposed pipeline and tanker route would traverse the Fraser River and its estuary—one of the most productive salmon watersheds in the world and the most economically important in Canada. The watershed is used by 42 fish species throughout the year for spawning, wintering and migration. 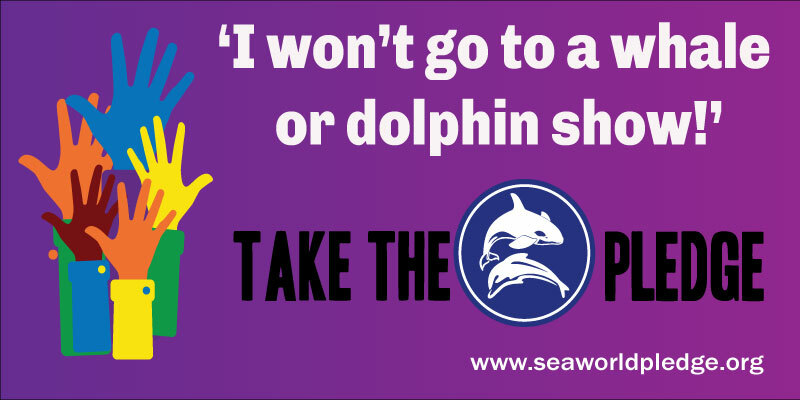 The increased tanker traffic alone could have a negative impact on the orcas. Killer whales use sound for navigation, communication, selecting mates and finding prey. “The existing level of noise has already degraded critical habitat and studies suggest it has reduced the feeding efficiency of these whales,” Raincoast wrote to the NEB. 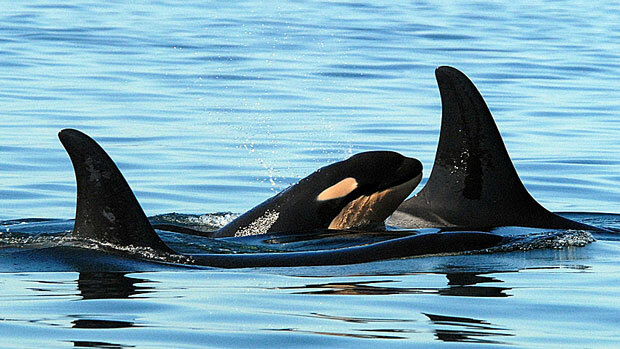 The U.S. Environmental Protection Agency’s website states that orcas are culturally, spiritually and economically important to the Salish Sea. An oil spill could obviously have a devastating impact on this ecosystem, the local economy and a way of life for many Canadians, particularly First Nations. Given that the Southern Resident killer whales rely on salmon for their food supply, any degrading of the salmon population would also hurt this orca population that’s already at risk of extinction. Of course swimming, breathing and feeding amidst a sludge of oil would have a negative impact on any animal’s health. According to the New Orleans Times Picayune, a peer-reviewed study of deaths among bottlenose dolphins in the northern Gulf of Mexico found the highest number of animal strandings and deaths between 2010 and early 2013 occurred in areas most impacted by the 2010 BP Deepwater Horizon oil spill. “The timing and location of this cluster is consistent with the spatial and temporal distribution of oil to Bay, sound and estuary habits in that region during and after the DWH oil spill,” the study concluded.